“If you build it, he will come,” the voice said. We’ve been readying ourselves to expand our server capacity, and would-be beta testers—20,000 of them, in fact—will soon be coming to play Prismata. So in preparation for the huge influx of new players, I’ve decided to make a sequel to our original how to play video for beginners, and the supplementary text guide. 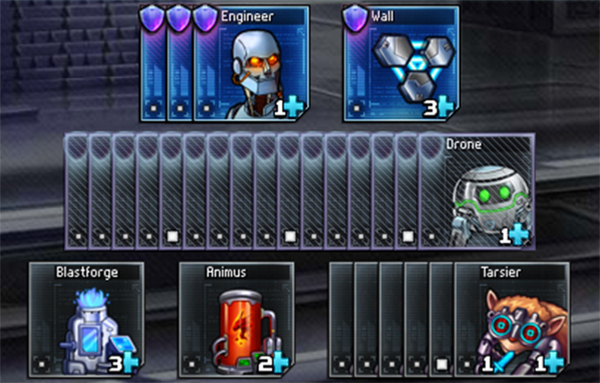 They were successful in explaining the rules and user interface of Prismata, but some players, especially those unfamiliar with real-time-strategy decision-making, had no idea what to do each turn. Should I be building Drones, or laying down a lot of Blastforges, or spamming attackers? In this article, I hope to answer these questions with some simple rules of thumb—guidelines to help new players through the overwhelming amount of options. Of course, the true art in Prismata is discovering, through experience, when these rules should be broken. If you haven’t already checked out our introductory how-to-play video, you might want to have a look at that first. How many Drones should I buy? Players of many real-time strategy games often like to continue buying Drones (or equivalent economic production units) for the entirety of a match. This is almost never your best option in Prismata. As a general rule of thumb, you should usually aim to have about 12-15 Drones and then stop buying them. Games of Prismata are won by attacking, and your primary goal in Prismata should be to construct a powerful attacking force as quickly as possible. It’s usually optimal to build only enough Drones to sustain the production of attackers, and then switch to spending all of your resources on buying attackers (and defenders, if necessary). Calculating the right number of Drones to buy before making the switch is very difficult. It always depends on a variety of factors, like what set of units you’re playing with and what strategy your opponent chooses. If there are high-health defensive units available, for example, it may be wise to get more Drones than usual because the first few attacks can be efficiently thwarted. Ideally, you want the perfect number of Drones to enable you to efficiently construct some amount of attackers and defenders every turn with little waste. However, even if you find yourself running a few gold short, resist the urge to buy more Drones—you may be better served saving the gold for an attacker next turn, or buying engineers for defense. Tip: Many new players make a third Engineer to increase their Drone production. Although this is worth it if you’re planning to get to 18 or more Drones, the greedy econ strategy is actually dangerous for a beginner to attempt. A third engineer delays your defense, and a determined opponent may be able to rush you down with early attackers if you don’t react properly. This is possibly one of the most complicated facets of Prismata, especially to newer players. A common mistake among beginners is to buy more tech (Animuses, Blastforges or Conduits) than necessary, which is useless if you have an insufficient amount of Gold production per turn. Remember: there are almost no units in the game that require Red, Blue or Green but no Gold. Your main objective should be to not waste Blue or Red, because they do not get stored between turns. Wasting them can seem harmless, but you end up losing out on a lot of potential value (if you had bought a Drone instead, that Drone would be producing Gold which can be stored, instead of Blue/Red that just decays). Try to ensure that you have enough Drones to produce the amount of Gold that you need to support your tech. For example, if you have 5 Drones per Blastforge, you know you will always be able to produce a Wall each turn. If you have 9 Drones per Animus, you will be able to produce a Tarsier and a Rhino. 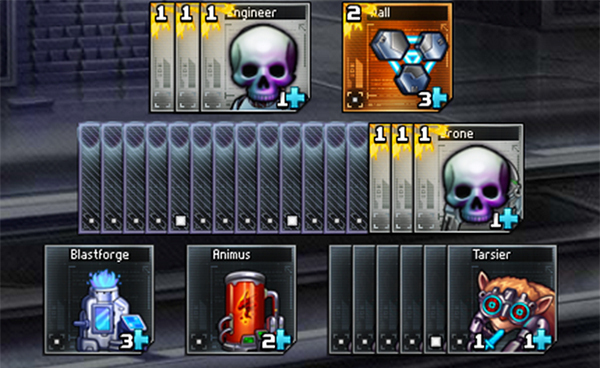 If your goal is to produce 2 Tarsiers and 1 Wall per turn (a decent strategy because Wall protects the low-health tarsiers), ensure that you have at least 13 Drones to go with your Animus and Blastforge. As a general rule of thumb, get your Drone count up there first. Err on the side of too many Drones. That extra gold can be used to buy Engineers if you need more defense, or it can be stored for a resource-poor late-game. Should I buy attackers or defenders? Amassing a large amount of defense early is rarely (if ever) worth it, because you will fall behind in attack while your opponent’s attack whittles down your Walls. The correct amount of defense to buy is usually just the minimum you need to have in order to not be breached. This means you want your total defense to be one higher than your opponent’s potential attack next turn. But rather than preemptively buying Walls before your opponent has any attackers, opt for Steelsplitters or other attackers that can give you an early advantage before your opponent has robust defenders. Then, after your opponent has bought their first attacker, get a Prompt defender that can absorb the damage right away. In the late-game, it’s important to continue buying as much defense as possible to prevent your opponent from breaching you, especially if you have breach-vulnerable units like Tarsiers (losing them in a breach will put you at a large disadvantage). Forcefields are a great defensive unit for this stage of the game, as preventing breaches becomes far more important than losing Drones. Tip: Sometimes your opponent’s “true” attack potential is lower than the displayed attack potential value (in square brackets), because your opponent can be forced to lose an offensive unit on defense (e.g. a Steelsplitter or Rhino) before it gets the chance to deal damage on the opponent’s next turn. Watch out for this so that you don’t overcommit to defense. Each unit has its own unique abilities, and unit properties like Health, Prompt, Lifespan and Fragile are all built into the pricing of the unit. When players buy a unit but don’t use it to its full potential, they are losing value. In a set with Defense Grid and other strong defensive units, and with no Chill or burst damage, I amass Gauss Cannons (each with 5 health) and many Walls and other strong defenders. This strategy is foolproof because not only do I have lots of defense capable of absorbing incoming damage, but I also have attackers with lots of health. Right? In other words, after just 6 turns, I’m already 18 Gold behind, because I’m paying extra for a robustness that I’m not using! Of course, by making Gauss Cannons I am a turn ahead in attack (because Tarsiers take 2 turns to build), but this advantage is not worth 18 Gold. In this sort of situation, it would be more efficient to just create Tarsiers. New players often resort to buying Base Set units too frequently, because those are the units new players are most familiar with. But remember: they’ve intentionally been balanced so that they’re just a bit weaker than the units that show up in the Random Set. Your strategy should depend heavily on the Random Set, particularly if you are playing with Base + 8 or the Grandmaster set. “Breach” is the term that we use to describe your opponent having an attack potential that is greater than or equal to your defense number. Games of Prismata often end soon after a player gets breached for the first time, because it can be very hard to recover from the sudden loss of several key attacking units. Although it may seem okay if your opponent breaches you for 0 damage (meaning that your total defense is equal to your opponent’s total attack), this can still put you in a catch-up position, because you will lose all of your defenders (instead of having 1 defender remain alive after absorbing damage). This is especially true if your opponent has a stronger economy that generates more resources per turn than yours. You lose absorb value: If you have a Wall for defense, it can absorb 2 damage every single turn without dying. If that Wall dies, you no longer have that absorb value. Tip: Leaving Drones back to block is a necessary last resort. Many beginners try to avoid losing Drones at all costs, but using Drones for defense can keep your crucial attackers alive for a many turns longer. In this situation, I lose 3 Engineers and 3 Drones, instead of 3 Engineers, the Wall, and 2 Tarsiers. I do end up 3 Gold poorer from the Drones not working for a turn, but trading 3 Drones and 3 Gold for a Wall and 2 Tarsiers is definitely a good deal. The way you defend should depend wholly on your gameplan, available technology, and the types of attackers that your opponent has. As with all the tips in this guide, no one strategy is universally better than another, but these general guidelines are a solid place to start. Stay tuned for upcoming expert strategy guides—that include tips like when it’s okay to get breached—and an introduction to theorycrafting in Prismata.